On this project, we were hired to sand down a great looking herringbone oak floor and totally change the color. 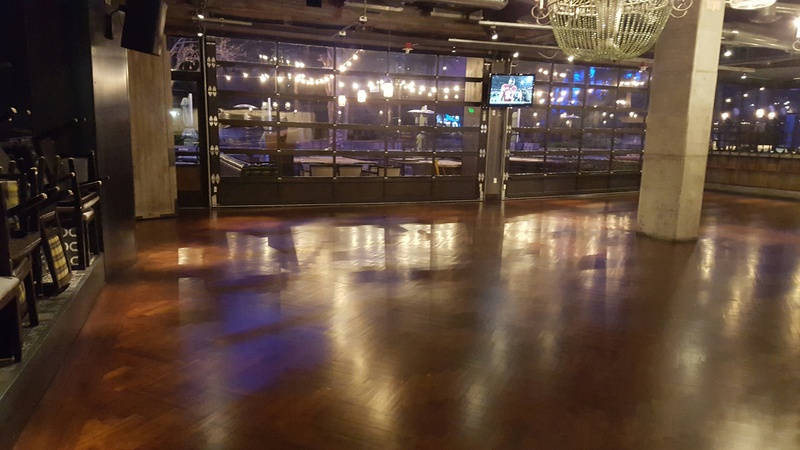 As with many of our commercial hardwood flooring projects, our work was performed after hours so forgive us if the pictures are a little dull. We took an oak herringbone floor with a light color and high gloss finish and sanded it down with our Bona Dustless sanding systems to raw wood. We then applied a much darker Bona cocoa Quick dry stain and then we finished the hardwood oak floors with Bona Traffic Satin. We love installing custom pattern hardwood floors as well as restoring them; it just makes the work that we do much more interesting! Our hats are off to the work the commercial crews put in! Below you can see the process. Sanding oak herringbone at night in a great Restaurant.